In Saddam We Trust: A tyrant's denials are now "proof"
A tyrant's denials are now "proof"
The Senate Intelligence Committee has concluded that Saddam Hussein had no connection to al-Qaeda. How did it discover that? Why, by asking him, of course. Ignoring an abundance of contradictory evidence, including reams of investigative reporting by The Weekly Standard's Stephen Hayes and former London Sunday Times reporter Richard Miniter, the committee has taken Saddam and his aides at their word. This is the same approach that was taken by the Duelfer Report, which, legend has it, proved that Saddam had no weapons of mass destruction. At least the Duelfer Report acknowledged its extensive reliance on Saddam and his fellow detainees as a handicap. This Senate report, on the other hand, accepts their claims with an astonishing lack of cynicism. On page 70 of the 151 page document, it notes that Saddam's interrogators confronted him with evidence that his government had met with Osama bin Laden. 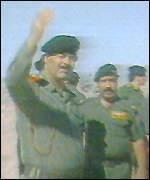 Saddam acknowledged the meeting, but "then specified that Iraq did not cooperate with bin Ladin [sic]. In response to the suggestion that he might cooperate with al-Qa'ida [sic] because 'the enemy of my enemy is my friend,' Saddam answered that the United States was not Iraq's enemy. He claimed that Iraq only opposed U.S. policies." Gosh. It sounds like we've misunderstood the big lug all along. He probably even "supports the troops" while opposing the war. No wonder the committee -- whose seven Democrats are joined by liberal Republicans Chuck Hagel and Olympia Snowe for a 9-6 anti-war majority -- found him so credible. The report says that a "top official in Saddam's government" named Abid Hamid Mahmoud al-Kattab al-Tikriti "admitted to a 'weak' connection between the Iraqi Intelligence Service and al-Qa'ida for the purpose of the IIS collecting intelligence on al-Qaeda." So a second source within Saddam's government agreed with him that there had been contact between the Iraqi government and bin Laden's organization, but that there was no cooperation between the two. That's what sadly passes for corroboration, as far as the committee is concerned. The claim that the IIS only established contact with al-Qaeda in order to spy on them is about as credible as the characterization of Saddam's training camp at Salman Pak as a "counterterrorism" facility. Oh, but wait a minute, the Senate Intelligence Committee accepts that explanation, too. It's a wonder the senators didn't endorse the Gulf War "baby milk factory" story while they were at it. Without a hint of awareness of its own irony, the Duelfer Report catalogued the many lies that had been told by Saddam's scientists during the period between wars, but then uncritically accepted their unverifiable tale of the destruction of Iraq's chemical and biological weapons. Likewise, this new report implicitly trusts unabashed liar Saddam Hussein, whose information minister became a worldwide laughing stock for the conviction with which he stated the most incredible whoppers. The Intelligence Committee report spends quite a few pages dismissing the claims of Iraqi defectors, some of whom have proven to be unreliable, but never does it pause to question the reliability of Saddam and his loyalists, despite their obvious motivations to lie. If Saddam's interrogators didn't tell him that they knew of a meeting between his government and al-Qaeda, and instead asked him if it had happened, he probably would have denied it. The committee, if it were to remain consistent, would now be telling us that no such meeting ever took place. * "Report: Saddam killed Kurds in act of self defense"
* "Report: Iraq fully complied with UN resolutions"
* "Report: Kuwait is Iraq's 19th province"
Well, why not? We've based our policies on our disagreements with these statements, so shouldn't we know if we've been mistaken? We're aware that Saddam has said all these things, and that he continues to believe them. Now all we need is for other members of his former regime to agree with him, and that will qualify as proof that the war in Iraq was a mistake. Having twice been defeated on the battlefield, Saddam Hussein, through his debriefings, is now winning the battle of the American homefront. If only he'd known it would be this easy, he'd have let himself be captured 15 years ago.